If you suffered severe injuries in an accident with a large truck, you are understandably worried about recovering from those injuries and paying the resulting medical expenses. You need to know your legal rights and are entitled to monetary compensation. The truck accident lawyers of Lawrence & Associates have represented many truck accident victims, helping them secure the money they need to take care of themselves and their families. Truck accidents are some of the most devastating kinds of crashes, and they often result in the most severe injuries. A car is no match for a tractor-trailer, and the results can be disastrous. When fatalities occur, no amount of money can make up for the loss of a loved one, but we can help you get the justice you deserve. If you or a loved one was seriously injured in an accident with a large truck, contact Lawrence & Associates at (513) 351-5997 to schedule a free consultation. We’re ready to start fighting for you. After an accident with a large truck, your entire focus is on recovering from your injuries, getting back to work, and taking care of your family. You don’t have the time and energy to fight with the trucking companies, their insurance companies, and their lawyers. Having a truck accident attorney allows you to put your focus where it belongs while we fight on your behalf to get you the compensation you deserve. A truck accident attorney will investigate the facts of your accident. At Lawrence & Associates, we have accident reconstructionists and logbook auditors who will be able to uncover whether the truck driver operated their truck unsafely or whether the driver should have been on the road at all. A truck accident attorney will investigate whether the driver was negligently hired or credentialed or whether the driver’s logs were inadequate or falsified. An experienced truck accident attorney will also peel back the multiple layers of insurance that many trucking companies have. A trucking company may falsely represent to you the amount of insurance coverage it has. An experienced truck accident attorney knows better and will work to get you a more substantial recovery from the trucking company’s full insurance coverage. Your crash may likely have left you with severe and long-lasting injuries. A truck accident attorney has the knowledge and experience to evaluate your damages and the ability to call in experts who will testify as to the injuries suffered and expenses you’ve incurred. A truck accident attorney will fight to make sure that you are not only compensated for the losses you’ve incurred thus far but are also compensated for your future expenses. The Cincinnati truck accident lawyers of Lawrence & Associates have the specialized experience necessary to handle your truck accident case. Truck accidents cases are more complicated than the average car accident a less experienced attorney may end up leaving a victim unable to pay their past and future expenses. Our attorneys utilize numerous experts, such as accident reconstructionists and auditors, to prove the trucking company’s liability and establish your past and future damages to get you the compensation you deserve. We recognize the importance of customer service and make it a priority. When you have questions or concerns, we’ll make sure that you get the answers you need, keeping you advised of the details along the way. Lawrence & Associates doesn’t charge an initial consultation fee, and you do not pay us anything unless we obtain compensation for you. Our firm enjoys a 10.0 Avvo rating, we were named a Client’s Choice by Avvo in 2013. The National Trial Lawyers organization named us among the Top 100 trial lawyer firms. If you or a loved one have been in a truck accident, contact the experienced and award-winning truck accident attorneys of Lawrence & Associates at (513) 351-5997 today. Contact the truck accident attorneys of Lawrence & Associates; we’ll be your advocate against the trucking companies and their insurance companies. Unlike an accident between passenger vehicles, truck accident claims involve not only the truck driver but the trucking company. In addition to claiming that the driver was negligent, you can also claim that same negligence against the trucking company under the theory of respondeat superior (a party is responsible for the actions of their agents). Depending on the facts, you may also be able to file a direct claim against the trucking company asserting negligent hiring, negligent training, or negligent supervision. Trucking companies often have several layers of insurance coverage. They may have an initial policy of only several hundred thousand which they offer to you to get you to think that’s all the insurance that’s available. But those trucking companies frequently have millions in various levels of coverage. An experienced truck accident attorney with Lawrence & Associates can get to the bottom of their claims and get you the compensation you deserve. Do I have to pay to hire an attorney? When you hire Lawrence & Associates as your attorney, you pay nothing up front. We accept personal injury cases on contingency. That means you will only owe us a fee if we obtain compensation for you. If we obtain a settlement or a court judgment in your favor, our fees, cases expenses, and court costs will be paid out of your settlement or judgment. Unfortunately, the length of time it will take to resolve your claim depends on numerous factors, mostly the willingness of the other side to settle and the efficiency of the courts. Claims can be resolved quickly if the other party accepts liability and your damages are easy to calculate. However, in other cases, it may be necessary to take your claim to court. In any case, the truck accident attorneys of Lawrence & Associates will work diligently to get you the recovery you deserve as quickly as the justice system allows. In 2015, there were 22,490 crashes involving commercial vehicles, which includes buses and trucks. The Highway Patrol reports that in that same year there were 132 fatalities in accidents involving heavy trucks. We understand the worry you feel after a serious truck accident about how you’re going to pay your mounting medical bills, especially if your injuries have left you out of work. 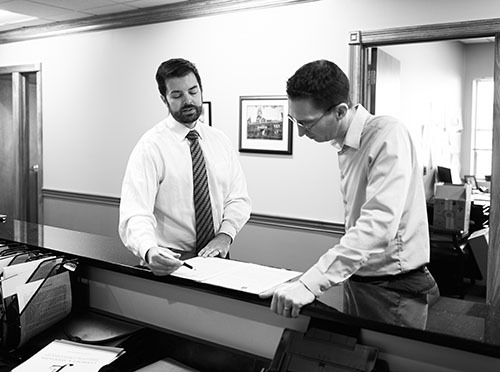 Our injury attorneys will work nonstop to ensure that those at fault for your accident are held accountable. If you or a loved one has been injured in a truck accident, don’t wait another day. Contact the Cincinnati truck accident attorneys of Lawrence & Associates at (513) 351-5997 for a free consultation.